Dr. Nguyen Tat Canh, a professor at Hanoi Agricultural University, began working with SRI methods in 2002, having learned about it at a workshop organized by the Institute for Development Enterprise (IDE). He focused on districts that have high rates of poverty in the middle of Vietnam (Quang Tri, Quang Nam, Thu Thien Hue, Thanh Hoa). Vietnam's Plant Protection Department (PPD) began conducting SRI training through Farmer Field Schools the next year as part of its FAO-funded integrated pest management (IPM) program. That same year, Dr. Hoang Van Phu at Thai Nguyen University began working on SRI after learning about it from Klaus Prinz in Thailand. Phu reported on results of replicated factorial trials in 2006, with SRI yields of 8.8 t/ha and a calculated reduction of 62% in water use and 85% in seed rate. The Ministry of Agriculture and Rural Development issued a formal decision October 15, 2007, acknowledging SRI as "a technical advance," and directing government agencies to "guide and disseminate " this innovation. In 2007, PPD with support from Oxfam America launched an SRI dissemination effort in Ha Tay province, and use of SRI methods went from 3,000 ha that year to 33,000 ha the next year. In 2008, there was expansion into other provinces, and in 2009, PPD with support from Oxfam America and Oxfam Quebec, assisted by the Centre for Sustainable Rural Development (SRD), began a SRI project in 12 communes in six provinces: Ha Tay, Yen Bai, Phu Tho, Thai Nguyen, Nghe An, and Ha Tinh. In early 2009, it was estimated that SRI was being fully applied in 14 provinces in northern and central Vietnam (see list in 2009 Gorman report), though evaluations have been undertaken in at least 17 provinces by researchers from Thai Nguyen University, Hanoi Agricultural University, the IPM program, and several other government agencies and NGOs. According to reports at a 2010 National SRI Workshop, in 2009, 440,833 farmers in 21 provinces used SRI methods on 232,365 ha (85,422 in the winter-spring season, and 146,943 in the summer season (see Dung ppt). Workshop reports noted that 20% of the farmers were using the full set of SRI practices, and the rest were using most if not all, but still getting benefits of higher yields with lower cost and less water usage. The application of SRI has helped farmers earn 1.8-3.5 million VND ($100-200) more per hectare as of 2010. In an October 2011 event, the Ministry of Agriculture and Rural Development reported that there are now over a million farmers (1,070,384, about 70 percent of them women) applying SRI methods on 185,065 hectares (457,110 acres). SRI farmers reportedly represented about 10% of all rice growers in Vietnam as of 2011. Publications from the event in both English and Vietnamese are now available online. For more on the Oxfam/Plant Protection Department (PPD) experience with SRI in Vietnam, see IFPRI's 2012 policy brief no. 15, which also outlines benefits to farmers in the 22 provinces that are applying SRI methods as of 2012. PPD subsequently won the National Golden Rice Award for its work with SRI on November 14, 2012. During 2013, articles on SRI in Vietnam appeared in two publications: Climate-smart agriculture success stories from farming communities around the world and Large-scale implementation of adaptation and mitigation actions in agriculture (Working Paper no. 50 of the CGIAR's CCAFS Research Program.) In addition GTZ put out a publication on their work promoting SRI in Trà Vinh Province. A grant by the European Union for the implementation of a project titled “Sustaining and Enhancing the Momentum for Innovation and Learning around the System of Rice Intensification (SRI) in the Lower Mekong River Basin” began January 1, 2013, and will end December 31, 2017. The main objective of the project, which is being implemented in Cambodia, Laos, Thailand and Vietnam, is to contribute to enhance resilience of rainfed small-scale farmers of the Lower Mekong Region confronting climate change. The primary partners are Asian Institute of Technology (AIT), the FAO Regional IPM Programme in South and Southeast Asia, Oxfam America, and Institute of Development Studies University of Sussex in UK. During 2014, SRI was included in a World Bank-funded Irrigated Agriculture Improvement Project undertaken in the Central Coast Region and selected provinces in the Northern Mountainous Region. Hoang Van Phu, who led the Vietnam delegation at the 2015 Southeast Asia Regional Conference on SRI in Alor Setar, Malaysia, presented the newly-founded Vietnam SRI Network (SRIViet) to the SE Asian SRI Community at the conference. During September 2016, a two-day event in Thai Nguyen brought together SRI stakeholders to appreciate ten years of SRI success in Vietnam and share their stories. The event highlighted perspectives and activities of SRI in Vietnam, and helped to better link the SRI-Viet network into the global SRI community. The SRIViet network's continued progress was outlined in an October 2017 meeting which outlined outreach plans and the partner's SRI activities. During 2017, the Ministry of Agriculture and Rural Development’s Institute for Agricultural Environment will use SRI as part of a plan to to reduce greenhouse gas emissions in wet rice production by 15 to 20 percent by 2020, and to help farmers will increase productivity, quality and economic effectiveness, reduce pesticides and nitrogenous fertilizers, and to encourage farmers to use green production methods. A Regional Review and Planning Workshop of the SRI-LMB Project organized in Hanoi, Vietnam on April 24-25, 2017. The results were reported from 172 action research sites spread over 33 districts in 11 provinces in four countries. In Thailand, SRI-LMB activities are in Bac Giang and Ha Tinh provinces. During October 2017, a Paddy and Water Environment article by Tuyet Thi Anh Truong et al showed that applying SRI methods in Thai Nguyen Province can save around 23% of energy inputs, while increasing energy outputs by 11%; economic benefits per hectare also rise by more than 8 million dong (USD 364) compared to those under the conventional cultivation system. [April 11, 2019] An article on the Bình Thuận website reports that from the winter-spring season 2016 - 2017 until the present, the projects "Testing the sowing density applying water-saving irrigation method" and "Intensifying rice cultivation by SRI method" have been continuously implemented in the Ham Thuan Bac, Tuy Phong and Tanh Linh districts of Bình Thuận province. In the winter-spring season of 2018 - 2019, the model was implemented in Duc Binh Agricultural Service Cooperative (Duc Binh cooperative), Tanh Linh, and showed that rice production by SRI method was highly efficient. The projects were in response to a program launched by the Ministry of Agriculture and Rural Development to reduce seed sowing to save production costs and restructure crops and to apply water-saving farming techniques to cope with drought, lack of water for production. Together with the NGO SNV (a Dutch development organization), the Provincial Agricultural Extension Center has supported the cooperative Duc Binh in conducting trials with AWD and SRI, during the winter-spring crop 2018 - 2019. In addition to trials with seeding rates, the Provincial Agricultural Extension Center selected 57 households from Duc Binh cooperative to implement SRI model with 25.4 ha. Results showed that while sowing density does not significantly affect the growth time of rice, it does influence to the height of rice. The density of sowing 8 kg / rod and 10 kg / rod has the highest number of effective branches, sowing 16 kg / sao resulted in poor tillering ability, and a seeding density of 12 kg / rod reaches the highest yield. For water regulation, 4 wet cycles and 4 times drying the field were tested. The withdrawal of water reportedly helps the roots grow better and the plants are tougher, limiting pests and diseases, especially brown backed rice plant hoppers, which are more harmful than the previous water retention fields. [June 4, 2018] High productivity, seed amount decreased by 2.5 kg / sao, nitrogen fertilizer reduced by 20-25%, water saving, and especially, not using plant protection chemicals (but having less rice pests! ): According to an article in Quảng Trị, Online, these are the advantages that explain why SRI which is currently being implemented in Hai Lang district. Supported by Hai Lang District Development Program (World Vision), during winter 2017 - 2018, Hai Lang Agricultural Extension Station implemented SRI in 6 communes: Hai Thuan, Hai Thien, Hai Truong, Hai Quy, Hai Xuan and Hai Hoa on an area of over 2.4 hectares with 37 households involved, using the seeds Hybrid 8 and Ma Lam 48. Bui Truong, Director of Thien Tay cooperative (Hai Thien commune) said that Thien Tay co-operative had 14 households participating in SRI cultivation on 0.9 ha area. According to Truong, households using SRI methods will be supported with new high-quality rice varieties (Thien Uu 8); guided toward organic agriculture, (organic inputs and, rather than insecticides, using preparations made from garlic, chili and ginger); and encouraged to use smallscale equipment and manage water. While farmers were skeptical, especially about seed and pesticide reduction, the harvest was over 60 quintals per hectare, and the rice had less shattering and was resistant to pests. Reduced density with SRI increases photosynthesis, limits pests and diseases by better airflow and microclimate, and enables rice paddies to develop more effectively. Soil conditions are improved by keeping soil moist; weeding the field to aerate soil; and using manure and other organic fertilizer to increase soil fertility. Specifically, with the SRI model, farmers use only 2 kg of rice / sao compared to 5-6 kg / sao. Compost from manure and agricultural by-products reduced the amount of chemical fertilizers by 30%. Herbicides are being reduced in favor of improved weeding tools and hand weeding. Beside the demonstration on an area of ​​nearly 2.5 hectares with 37 households participating directly, the model involves 180 students who are in households with children under 16, children with disabilities, poor and near-poor families. They study throughout the winter in Farmer Field Schools (FFS). Evaluation of the effectiveness of these models, Vo Thi Hue in Hai Quy Commune said: "Rice production under the model SRI farmers saves a lot. The first is the seed, previously sowing 1 sao of 5 - 6 kg rice seeds, now only 2 kg. The second is reduction of the amount of fertilizer, especially nitrogenous fertilizer, from 6 - 8 kg / sao down to 4 kg / sao. Also, despite reduction in pesticides, because of the plant spacing, rice fields are open, and have less pests. According to Mr. Duong Viet Hai, Head of Hai Lang District's Agriculture Department, despite the higher profit margin with SRI, only about 10% of the total area of more than 6,800 hectares of the district follow SRI methods. Some of the constraints are irrigation access, long-term heavy use of herbicides which make pulling weeds difficult, and uneven terrain, making transport of organic fertilizer to the field difficult. The district Agriculture Department will advise the district People's Committee to direct the localities to continue implementing SRI in the following years. At the same time, training courses, in combination with strengthening of advocacy, synchronizing production in larger fields, regulating water, controlling pest outbreaks, will contribute to a safe, effective and sustainable agriculture. [March 10, 2018] According to an article in Vietnam+, the “Adaptation in the Mekong Delta” (AMD) project will target 35 billion VND (1.54 million USD) from the climate change adaptation co-sponsoring fund (CCA) to support 1,400 households and 168 cooperative groups in Tra Vinh province in climate change adaptation during 2018. The fund is intended to encourage local farmers to apply rational production models to create sustainable income. Poor and near-poor households as well as cooperative groups in the 30 targeted communes will be given non-refundable aid equivalent to 50 percent of total planned production and business costs. Priority has been given to rice farming under the System of Rice Intensification (SRI), as well as clean and water-saving vegetable cultivation, and extensive aquaculture farming. The AMD project in Tra Vinh has been implemented in 30 communes of seven districts during 2014-2020, benefiting around 15,000 poor and near-poor households. The overall goal of the project is to develop sustainable livelihoods for rural residents in a changing climate and enhance the public’s capacity to adapt to climate change. [August 20, 2017] The Vietnam SRI Network met on August 8, 2017, to share updates by participants and representatives on various field and research projects, and to establish enhanced media channels for the network. A Coordinating Committee was elected, with Assoc. Prof. Hoang Van Phu (ICC) and Bui Van Minh (SNV) selected as coordinators; Maeda Keiko (FIDR), Ngo Tien Dung, and Le Nguyet Minh as commissioners; and Nguyen Trong Hung as secretary. Results of 2016-2017 network activities were presented. Various SRI-related projects were undertaken during 2016-2017 by ICC, the Plant Protection Department of Bac Kan, SNV, the Planting & Plant Protection Department of Quang Binh Province, and FIDR. SRI-related projects ranged from SRI promotion and adaptive research to emissions reductions, bio-waste minimization, and women's enterprises. (See network activity document for details). It was decided that the network will organize two meetings per year and participants/organizations would write case studies. Plans were also made to refresh the old logo, upgrade the website, and put together kits of documents that could be shared among members and on the website/social media. [May 19, 2017] Farmers from 11 provinces of Cambodia, Laos, Thailand and Vietnam have reported near doubling of profit for paddy grown with the System of Rice Intensification (SRI) management practices. This was a result of higher yield coupled with reduced cost of seed, seedlings, and pesticides; along with better quality of food-grains, thereby commanding a higher market price. These results and other project details were shared at Regional Review and Planning Workshop of the SRI-LMB Project organized in Hanoi, Vietnam on 24-25 April 2017. The results were reported from 172 action research sites spread over 33 districts in 11 provinces — three in Cambodia (Kampot, Kampong Speu and Takeo); three in Thailand (Uttaradit, Sisaket and Surin); two in Vietnam (Bac Giang and Ha Tinh); and three in Laos (Khammouan, Savannakhet and Vientiane). [March 23, 2017] According to an article in CUBIRD.com, Mai Van Trinh, Director of the Ministry of Agriculture and Rural Development’s Institute for Agricultural Environment, reported that that new water- and cost-efficient farming techniques will allow Vietnam to reduce greenhouse gas emissions in wet rice production by 15 to 20 percent by 2020. Trinh was speaking at a recent conference on the first phase of the Project on Reduced CH4 Emissions in Wet Rice Cultivation in Vietnam, jointly held by his institute and the Manila-based International Rice Research Institute in Hanoi. To achieve the target, the ministry will use the SRI to help farmers increase productivity, quality and economic effectiveness, while reducing pesticides and nitrogenous fertilizers, he said. In addition to these measures, the ministry will also encourage farmers to use green production methods. The sector will also apply Good Agricultural Practices (GAP) in cultivation, which means using techniques that consume less fertilizers and water, employing better land preparation techniques and reducing methane emissions. [March 5, 2017] According to a recent article on the Talk Vietnam website, Minister of Agriculture and Rural Development, Cao Duc Phat, made a speech as a special guest at the invitation of US Agriculture Secretary Tom Vilsack during a recent side event for the 21st Conference of Parties (COP21) with participants from the Global Alliance for Climate Smart Agriculture. Sharing Vietnam’s agriculture experience in coping with climate change, Minister Phat said that in regards to rice production, the country has encouraged farmers to apply advanced techniques through System of Rice Intensification (SRI), which helps reduce 30% of fertilizer and pesticides, increases yields by 10-20% and reduces greenhouse gas emissions by 30%. [November 20, 2016] The National Review and Planning Workshop in Vietnam was held in Bac Giang province on November 18, 2016. The event was organized by the Plant Protection Department (PPD), Ministry of Agriculture and Rural Development (MARD) and Crop Production & Plant Protection Sub- Department (PPSD Bac Giang and Nghe An) in partnership with AIT, FAO and Oxfam. The objectives of the workshop were to share key learnings from previous years’ SRI-LMB Farmer's Participatory Action Research (FPAR) implementation by trainers and farmers and review the overall process of FPAR to identify and establish research oriented learnings. [October 9, 2016] An event entitled The SRI Journey in Vietnam: A Decade On was held September 27-28, 2016, in Thai Nguyen. The meeting brought together SRI stakeholders to appreciate ten years of SRI success in Vietnam and share their stories. The event highlighted perspectives and activities of SRI in Vietnam, and was also aimed at better linking the SRI-Viet network into the global SRI community. [See papers by Ngô Tiến Dũng and Hoàng Văn Phụ presented at the event. The English version of their talk, The 10 year journey of SRI in Vietnam, is also available on the SRI in Vietnam website as is the Vietnamese version, Hành trình 10 năm SRI tại Việt Nam. [September 22, 2015] A three-day seminar on "greener rice cultivation" in Vietnam and across the Greater Mekong Sub-region (GMS) opened in the northern Thai Nguyen province on September 21, 2025. Nearly twenty reports and studies were presented by representatives from Vietnam, Myanmar, Laos, Thailand, Cambodia, and China’s Yunnan and Guangxi provinces. Following presentations on sustainable farming presentations, which were primarily focused on organic SRI methods, participants made field trips to see rice paddies applying SRI methods in Thai Nguyen’s Phu Luong and Dinh Hoa districts. According to reports at the event, more than 1.5 million farmers in 29 provinces and cities in Vietnam have applied the SRI on over 500,000 hectares. (See major SRI adoption areas at right). Hoang Van Dung, Deputy Head of the Thai Nguyen Department of Agriculture and Rural Development, said that SRI has generated positive outcomes in his province, which is reflected in crop health as well as up to 15 percent yield increases. Hoang Van Phu introduced participants to Vietnam's new SRI network, SRIViet (see PowerPoint presentation). According to Tran Kim Long, Head of the Ministry of Agriculture and Rural Development’s International Cooperation Department, rice cultivation in Vietnam produces an average of 27.8 million tonnes of CO2, accounting for 67 percent of the total greenhouse gases emitted by the sector. This contributes to making Vietnam 31st worldwide in terms of emissions. To address the issue, Vietnam is improving its land and farming management, including the use of SRI, as well as boosting the spread of biomass energy. (See article in Vietnam+ for details). [May 28, 2015] Hoang Van Phu led the Vietnam delegation at the Southeast Asia Regional Conference on SRI, which was organized by the SRI-Mas Network in Alor Setar, Malaysia, on May 26-28, 2015. Thirteen international participants, including the heads of the SRI national networks from Indonesia, the Philippines, Sri Lanka, and Vietnam, were sponsored by SRI-Rice to attend the conference. Dr. Phu presented the newly founded Vietnam SRI Network (SRIViet), which is a knowledge hub for SRI and sustainable rice interests to share information, research and resources in order to enhance voice of rice producers, advocacy of enabling policy and support. SRIViet founders include Oxfam, SNV, ICC - TNU, FCRI, CASRAD, IAE, Veco , FIDR, PPDs, SRD). [January 25, 2015] According to Mai Van Trinh, director of the Ministry of Agriculture and Rural Development's Institute for Agricultural Environment, new water- and cost-efficient farming techniques will allow Vietnam to reduce greenhouse gas emissions in wet rice production by 15 to 20 per cent by 2020. Trinh spoke at a January 23 conference held by the Institute for Agricultural Environment and IRRI on the first phase of the Project on Reduced CH4 Emissions in Wet Rice Cultivation in Vietnam. To achieve the target, the ministry will use SRI-- a plan in which farmers will increase productivity, quality and economic effectiveness, while reducing pesticides and nitrogenous fertilizers. In addition to these measures, the ministry will also encourage farmers to use green production methods as well as applying Alternative Wetting Drying (AWD) and Good Agricultural Practices. (GAP means using techniques that consume less fertilizers and water, employ better land preparation techniques and reduce methane emissions). Hằng, Kiều. 2019. Thâm canh lúa tiết kiệm nước (Water-saving rice cultivation). Bình Thuận website. April 11. [SRI trials focusing on seed reduction and AWD have shown reduced cost and improved prodcutivity in Bình Thuận province in Vietnam. Provincial Agricultural Extension Center: The Provincial Agricultural Extension Center requests the Department of Agriculture and Rural Development to consider and plan to integrate SRI solutions into programs and projects to expand the scale and focus on sustainable agricultural production. The NGO SNV continues to implement the project, aiming at bringing SRI to a large scale. 2018. Seeing is believing. Growing Hope Globally website. 2018. Phân bón cho lúa theo phương pháp canh tác lúa cải tiến (Fertilizer for rice under the method of improved rice cultivation). AgriVietnam.com. October. Lê An. 2018. Hiệu quả từ mô hình thâm canh lúa cải tiến (Efficiency from improved rice intensification model). Quảng Trị, June 4. 2017. The meeting on SRI VietNetwork. SRI in Vietnam website. September 27. Bình, Thanh. 2017. Cấy thưa - phương pháp đã chứng minh hiệu quả tại nhiều nước. Khoa Học Phát Triển, July 11. Brick, Tricia. 2017. Improving Crop Resilience and Income for Rice Farmers in Thai Nguyen Province, Vietnam. Buddhist Global Relief website. June 8. [Together with ICC at (ICC) of Thai Nguyen University, BGR funds supported 200 farmers in 9 villages to attend SRI Farmer Field Schools, trainings and conferences in Northern Vietnam]. AIT. 2017. System of Rice Intensification (SRI) findings shared at Hanoi workshop. ThaiPR.net, May 19. SRI-LMB. 2017. Concept note: Regional Review and Planning Workshop 2017. SRI-Lower Mekong River Basin webiste. January 2017. 2016. 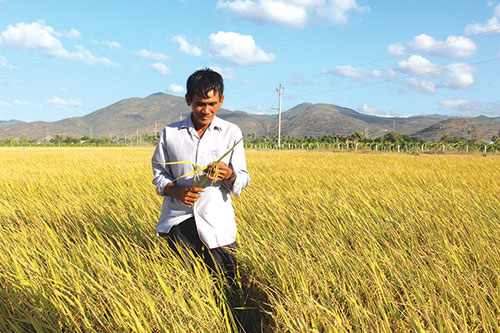 Project improves rice growing in mountainous areas in Quang Nam. Vietnam+. December 1. Dũng, Ngô Tiến and Hoàng Văn Phụ. 2016. System of Rice Intensification in Vietnam: A Decade Journey. System of Rice Intensification website. (in Vietnamese) (17p, 362 KB pdf) [Paper presented at the event entitled The SRI Journey in Vietnam: A Decade On, held Sept. 27-28, 2016, in Thai Nguyen, Vietnam. 2015. Tra Vinh: Rice farmers earn extra income with intensive farming. Vietnam+ . December 11. NDEL. 2015. Partage d’expériences sur la culture du riz biologique au Vietnam. Nhân Dân en ligen, September 22. Linh, Hoang. 2015. Nouveaux modèles agricoles dans le delta du Mékong. Le Courrier du Vietnam, April 12. 2015. Workshop on training need assessment for grassroot agricultural extension officers. Sustainable Rural Development (SRD) website. February 10. 2014. Vietnam, World Bank sign $390 mln in fight against poverty. Thanh Nien News. April 24. Dill, Johannes, Georg Deichert, and Le Thi Nguyet Thu (eds.). 2014. Promoting the System of Rice Intensification: Lessons learned from Trà Vinh Province, Viet Nam. Infoagro website. July. (25p.) [A publication of Deutsche Gesellschaft für Internationale Zusammenarbeit (GIZ) in collaboration with the International Fund for Agricultural Development (IFAD)]. Hufstader, Chris. 2014. Avoiding pests in Vietnam. Oxfam America website,Stories section. January 31. Hufstader, Chris. 2014. Growing more but working less. Oxfam America website. January 22. Neate, Paul. 2013. "Sustainable intensification of rice production in Vietnam," pp. 11-13 in Climate-smart agriculture success stories from farming communities around the world. Wageningen, Netherlands: CGIAR Research Program on Climate Change, Agriculture and Food Security (CCAFS) and the Technical Centre for Agricultural and Rural Cooperation (CTA). Frederick, Carrie. 2013. White Gold - A look at organic rice farming in Vietnam. Carriefrederick's Blog. September 23. Nierenberg, Danielle, and Kathleen Corr. 2013. Family farmers can feed the world - Why are we looking elsewhere?, Thanh Nein. September 10. Le, Minh. 2013. Simple and Effective: System of Rice Intensification in Vietnam. Oxfam America website. May 16. Cappiello, Sidsel F., and Peter Cooper. 2012. 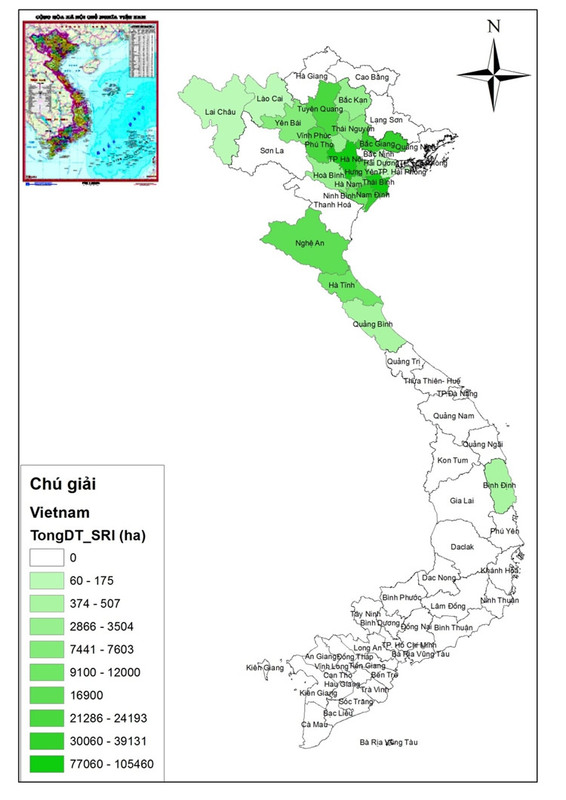 The System of Rice Intensification in Vietnam. In The large-scale implementation of adaptation and mitigation actions in the agriculture and food sector: Case studies November 2012, 47-49. CGIAR's Research Program on Climate Change, Agriculture and Food Security (CCAFS). Castillo, Gina E., Minh Nguyet Le, and Kimberly Pfeifer. 2012. Oxfam America: Learning from the System of Rice Intensification in Northern Vietnam. (Policy Brief no. 15). In Scaling up in agriculture, rural development, and nutrition, ed. Johannes Linn, no. 19. June. Washington D.C.: IFPRI. - Test draft Field Farmer School (FFS) Field guideline in Yen Bai province. May 28. - Apply the SRI/FLAIR accounting software in practice. May 28. - Field workshop on SRI adoption large-scale demonstration model. May 28. - Key Farmer Club (KFC) established in Kim Loc commune, Ha Tinh province. May 22. Meadu, Vanessa. 2012. Growing more rice with less water in a changing climate. Climate Change: Agriculture and Food Security website. April 22. Green, Tom. 2011. 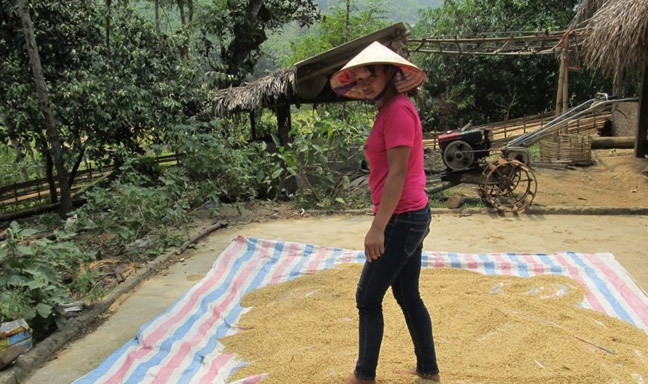 BGR project aids farm families in rural Vietnam. Buddhist Global Relief website. May. Seang, Soleak. 2011. More than 1 million growers are now embracing innovative approaches to producing more rice. Oxfam America website. October 6. Di, Thien. 2011. SRI Helps Vietnam’s small-scale farmers increase production. Vietnam Business Forum, October 20. Nguyen, Thu. 2011. Over 1 million Vietnamese farmers benefits from SRI, People's Army Newspaper Online, October 18. Logan, Emily. 2011. In the fight against hunger, women lead the way. Care2 blog. March 3. Seang, Soleak. 2010. Bold commitment to innovation. Oxfam America website. September 29. 2010. Ứng dụng hệ thống canh tác lúa bảo vệ môi trường. Vietnamnet.com. May 28. 2010. National SRI Network Workshop. SRI in Vietnam blog. March 1. 2009. Oxfam Quebec (System of Rice Intensification – Advancing small rice farmers in Vietnam). Education for Sustainable Development in Vietnam blog. January 21. Uphoff, Norman. 2007. Trip report from visit to Vietnam, July 7-14, 2007, reviewing SRI Progress. System of Rice Intensification website. July 7-14. (20p., 289KB pdf) [Trip report for the Cornell International Institute for Food, Agriculture and Development] Trip report for the Cornell International Institute for Food, Agriculture and Development. Ithaca, NY. 20 p.
Dung, Ngo Tien. 2006. SRI application in rice production in northern ecological areas of Vietnam. System of Rice Intensification website. (12p., 709KB pdf) [Vietnam National IPM Program updates through 2006]. The SRI in Vietnam website provides information on SRI in general and also the activities of SRI Vietnam Network that now operates it. SRD website's SRI program page). The System of Rice Intensification (CaiRan) website documents the activities of the NGO Vietnam France Échanges to introduce SRI to the community in Cai Ran, Vietnam. The site is translated into French, English and Vietnam. 2017. Presentations at the Regional Review and Planning Workshop 2017 of the Project on Sustaining and Enhancing the Momentum for Innovation and Learning around the System of Rice Intensification (SRI) in the Lower Mekong River Basin (SRI-LMB), held April 23-25, 2017, in Hanoi Vietnam. 1) Monitoring, Evaluation and Learning (MEL): Regional Trend. 37 slides. 2) Monitoring, Evaluation and Learning (MEL) in Vietnam. 31 slides. 3) Key FPAR Learning and Draft Work Plans, Vietnam. 25 slides. Van Phu, Hoang, Le Nguyet Minh, and Dao The Anh. 2016. Policies and public services on agro-ecological rice production: The case of System of Rice Intensification in Viet Nam. 12 slides. Presentation at the national multi-stakeholder workshop Towards an Agro-ecological Transition, May 5-6, 2016, Hanoi, Vietnam. ALi-SEA website. Phu, Hoang Van. 2015. Vietnam SRI Network. Presentation at the Low-Carbon Rice Farming Workshop, Thai Nguyen city, Vietnam, September 22. 15 slides. Nghia Nguyen. 2015. Development of integrated rice-azolla-duck-fish farming systems with SRI methods for rice production in the Mekong River region, Vietnam. Presented at SRI-Rice Seminar Series, Cornell University, July 1, 2015. 29 slides. - PowerPoint presentation by Ngo Tien Dung, head of the National IPM program for the Ministry of Agriculture and Rural Development (MARD), given at the Pre-Congress SRI Day, convened in Hanoi, Vietnam, November 8, 2010. 34 slides. 2009. SRI in Vietnam: Comparison with Conventional Methods Note: All data from 2008 Summer/Fall Season. - PowerPoint presentation available on slideshare.net from Tim Gorman. 9 slides. - PowerPoint presentation available on slideshare.net from Tim Gorman. - PowerPoint presentation by Mr. Dung at the Knowledge Exchange on SRI: Producing More with Less Water, a SE Asia Regional SRI Workshop held at the Asian Institute for Technology, Bangkok. 8 slides. - PowerPoint presentation by Le Thi Nguyet Minh and Andre Dorr, Oxfam America, Hanoi. 13 slides. - PowerPoint presentation, Japan International Volunteer Center. 24 slides. - PowerPoint presentation by Le Nguyet Minh, Oxfam America, Hai Duong . 15 slides. - PowerPoint presentation by Hoang Van Phu, Thai Nguyen University, Vietnam . 14 slides. The SRI-Rice Vietnam Photo Collection contains pictures obtained from Norman Uphoff and others. If you have Flash installed you can view this collection as a slideshow embedded in the Vietnam summary at the top of the page.